Beyond their signature Vans swag, you'll notice a couple of things in common between your favorite sidewalk surfers and the Vans Hi-Standard Snowboard Boots. For starters, the finely calibrated quality and durability that only 50 years in the footwear industry provides. Vans best-selling boots of all time, the Hi Standards provide an uncompromising fit thanks to heat moldable Flex Liners outfitted with a comfort-inducing UltraCush™ layer, plus traditional lacing that lets you dial in the perfect fit from your first ride to that last slushy park lap. Vans premium V2 Footbeds and Reverse Waffle Soles offering unmitigated boardfeel round out the features on these boots that set these for seasons of reliable, time-tested performance. 3 (1 Soft - 10 Stiff) – Soft-mid flex tuned for park riding and those looking to simply progress their skills. 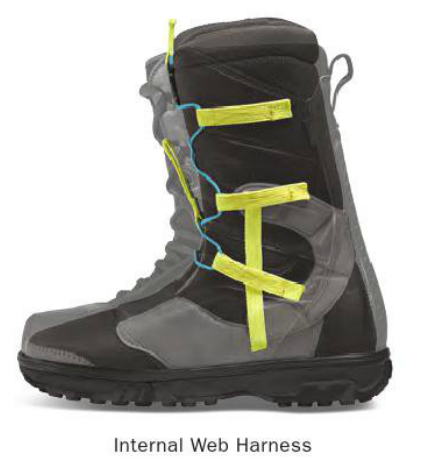 Internal Web Harness – Vans sets the standard in every boot with versatile harness options. The Internal Web Harness is where it all begins. Flex Liner – For the rider who likes a little flex in their liner but can do without break-in delay. The Flex Liner needs nothing added to Vans' instantly perfect fit that rides on 50 years of footwear knowledge. V2 Footbed – Vans snowboard boots are grounded by Vans' premium footbeds, developed in-house with precise attention to detail. With uncompromising effectiveness in mechanical support and dampening, the V2 footbed is the foundation for ultimate and seamless riding comfort. Dual-Density UltraCush™ Lite Construction – With forefoot and heel impact-relief pads. Reverse Waffle Sole – A Vans outsole means Vans grip, and the Reverse Waffle outsole has plenty. Bringing half a century of footwear experience to bear, this durable shred foundation fights fatigue, absorbs impact, and optimizes feel and control. One-Piece Rubber Cupsole – For minimum footprint and maximum boardfeel. Vans' Special Recipe Rubber Compound – For all-terrain traction. Oversized Inverted Waffle Tread Pattern – For increased traction and optimum snow release. Heat Retention – To keep the warmth in and the cold out, all Vans boots come equipped with a thermal heat retention layer between the outsole and the liner. This layer reflects cold away from the foot and helps hold heat within the boot, keeping you nice and toasty.